Female pattern hair loss, though commonly associated with other conditions, is a genetic trait with a strong disposition that can be inherited from both parents. FPHL involves hair shedding in excessive amounts and the progressive thinning of volume and hair line. In understanding how the condition stands apart from other similar patterns, sufferers of FPHL have a better chance of addressing the issue. familiar scenario, however, is almost always the order of male pattern baldness. In women, this pattern of hair loss is much different. It is advised that women be on the look out for sure signs of FPHL and other mature onset conditions. FPHL typically begins on top of the head, slowly thinning towards the outer edges of the scalp. Though research is still uncertain, thinning usually begins sometime after menopause, suggesting that oestrogens may promote hair growth. However, professionals are certain that chronic telogen effluvium, or consistent hair shedding, is related to but not necessarily the same as FPHL. Chronic shedding can be due to stress, disease, or treatment of some form, but it does not necessarily denote an ongoing hair loss condition. Hair is produced in phases known as anagen and telogen. During anagen, the hair dies within the follicles and then lies dormant for around three months during the telogen phase. A new anagen phase then begins where the body proceeds to grow new hair again at the base of the follicle. With FPHL, this anagen phase ceases to produce new hair. 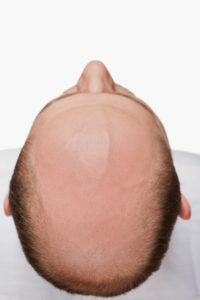 For this reason, thinning can happen in bursts of three to six months, followed by a full year without any unusual loss. This process, while purely cosmetic and not dangerous, can be distressing for women. Common effects associated with FPHL are depression and low self-esteem, leading to victims becoming introverted and given to feelings of unattractiveness during periods of hair loss. There are programs and treatments meant to slow the progression of FPHL. Hormonal treatment to block androgens, medications to promote hair growth, and scalp laser treatment are all possible options for patients. As hormone testing for FPHL is currently unreliable, women who have noticed early signs are encouraged to visit our center for help.